Quick and easy Bacon-Wrapped BBQ-Shrimp Kabobs are a tasty addition to any cookout. 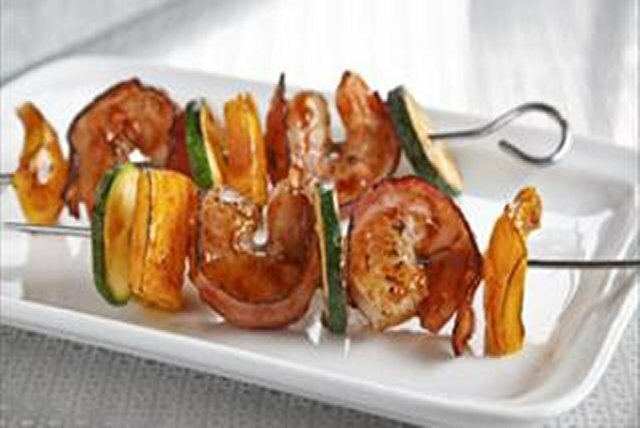 Bacon-Wrapped BBQ-Shrimp Kabobs combine some of our favorite flavors. Wrap 1 bacon piece around each shrimp. Thread 2 each shrimp, zucchini slices and pepper pieces alternately onto 10 skewers. Grill 3 to 4 min. on each side or until shrimp turn pink, turning and brushing occasionally with barbecue sauce. Prepare using your favorite cut-up fresh vegetables and flavor of BULL'S-EYE or KRAFT Barbecue Sauce.